View of the Vale of Avon in the County of Wicklow, Ireland. Situated in the mountains on the east coast of Ireland this is a very picturesque region. The Avonmore and Avonberg Rivers meet here to create the Ovoca river, which flows in a southerly direction into the Irish Sea at Arklow. The area is densely wooded and fertile and became well known when its beauty featured in the music of Thomas Moore in the early 19th century. 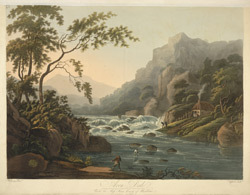 This picture was drawn by artist Thomas Walmsley (1763-1806). Walmsley began his career as a scene painter at the Royal Opera House in London but his reputation grew and he exhibited his paintings of Views in Wales and Ireland at the Royal Academy.